- No extra charge while they last. 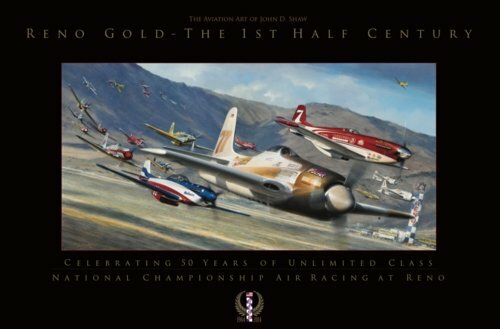 For the last 50 years, Reno race fans have been thrilled to the sounds and sights of highly tuned engines thundering overhead. There is perhaps nothing that stirs the emotions more than seeing a pack of Unlimiteds heading for the home pylon. It is the fastest sport in the world and if speed is what you need, here it is at 50ft altitude with speeds clocking in excess of 500 m.p.h. John Shaw's magnificent masterpiece traces the great Unlimited racers of the past half century. From Pond Racer, Conquest 1, and Smirnoff, to the modern duels between Strega, Rare Bear, and Voodoo. 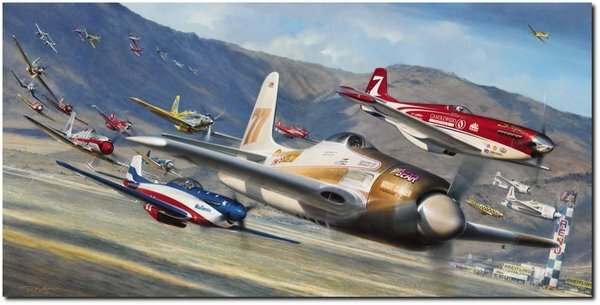 These great war birds festooned in colorful paint jobs, were flown by equally colorful pilots that bought man and machine together in perfect harmony. It takes great courage and skills of precision to fly at such speeds in close proximity.